Radiologic Technologists often hear these terms when radiation is described. The concept of Linear energy transfer (LET), can be difficult to understand unless it is carefully explained. The definition is that LET is a measure of the conservative force acting on a charged ionizing particle travelling through matter. So we aren’t actually talking only about the radiation, we are actually talking about the stuff hit by the radiation too. Linear, meaning the radiation travels in a line. And energy transfer, meaning how much of the radiation’s energy is transferred into the material it’s going through. This concept is relevant to X-ray as compared to other radiation types. LET is generally measured using particles with an energy over a certain threshold. Since the energy loss from the original source is part of the definition, LET is a positive quantity. LET depends on the nature of the radiation as well as on the material traversed. This is important to understanding LET. In other words, we are talking about two things, the radiation, and the target. If we use the analogy of bullets from a gun, we would need to discuss the ammunition as well as the target. A steel target would behave much differently than a watermelon. A high LET situation will attenuate the energy from the beam more quickly, generally making shielding more effective and preventing deep penetration. On the other hand, the higher concentration of deposited energy can cause more severe damage to any microscopic structures near the particle track. In biological cells, a microscopic defect can cause larger-scale failure of the cell system. Each type of radiation has a characteristic atomic make up and can be delivered over a range of different energies. As the radiation interacts with matter, it loses its energy through interactions with the atoms with which it associates. The average amount of energy that is lost over a defined distance; for example the energy deposited in ten cells is known as the Linear Energy Transfer (LET). LET is a measure of the conservative force acting on a charged ionizing particle travelling through matter, generally measured using particles with energy over a certain threshold. LET depends on the nature of the radiation as well as on the material traversed. High LET radiation includes particles with substantial mass and charge such as alpha particles. Low energy neutrons, which carry no electrical charge, are also a high-LET radiation. The distribution of energy in cells has a marked influence on the amount of biological damage done by a fixed amount of radiation. High-LET radiation deposits a large amount of energy in a small distance. For alpha particles, all the particles’ energy can be deposited in a few cells. Using our ammunition analogy, we can compare the alpha particle to a hollow point bullet. A hollow point bullet is designed to expand on impact. It disperses most of the energy close to the surface of impact. The melon on the left was shot with a full metal jacket bullet. The melon on the right was shot with a hollow point bullet. Low-LET radiation is from external electromagnetic radiation such as x-rays and gamma rays that have neither mass nor charge. Low-LET radiation penetrates tissues very easily and for any event deposit energy very infrequently. It might seem counter intuitive to call it low-LET, but think of it this way, less of the energy from the photon is transferred to the target, more energy is conserved in the photon as it travels. The energy deposition events from these low-LET sources are separated in space so that, on average, few ionizations or damaging events occur in any one cell from a single x-or gamma ray. Using our ammunition analogy again, this would be more like an armor piercing bullet or full metal jacket bullet. These bullets keep their shape on impact more so then hollow point bullets. By holding their shape, they can penetrate through the target more easily then hollow point shells, but are likely to transfer less energy to the 3 dimensional target in the process. High-LET radiation causes more molecular damage per unit of exposure or dose than low-LET exposure. This may be related to the concentration of energy from a single particle in a single cell and the ability of this energy concentration to trigger bystander effects that influence many more cells than are “hit” by the alpha particles. A high LET will attenuate the beam more quickly, generally making shielding more effective and preventing deep penetration. 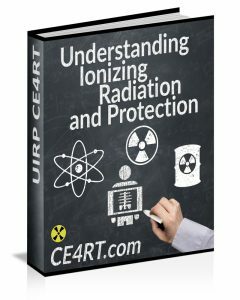 Many studies have attempted to relate linear energy transfer to the relative biological effectiveness (RBE) of radiation, with inconsistent results. The relationship varies widely depending on the nature of the biological material, and the choice of endpoint to define effectiveness. Even when these are held constant, different radiation spectra that shared the same LET have significantly different RBE. Despite these variations, some overall trends are commonly seen. The RBE is generally independent of LET for any LET less than 10 keV/µm. Human cells usually experience a peak RBE for LET’s around 100 keV/µm. These are very rough numbers; for example, one set of experiments found a peak at 30 keV/µm. Get ARRT* X-Ray CE credits today and join our community for news and special offers. Thank you for choosing CE4RT.com. * "ARRT© is a registered trademark owned by The American Registry of Radiologic Technologists. Although our courses are accepted by the ARRT for credit, as with all other online CE providers this website is not directly licensed by, endorsed by, or affiliated with The American Registry of Radiologic Technologists. 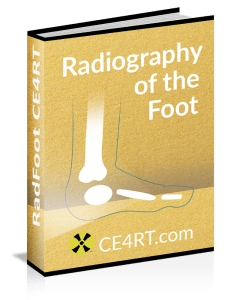 Register now and get our 1 credit course “Radiography of the Foot” free today.